Back in November, Ron Hynes left us after a protracted battle with Cancer. I was asked to paint his portrait almost immediately by a music colleague and friend. The finished painting is now with the family of this famous Newfoundland singer songwriter, as are several prints. 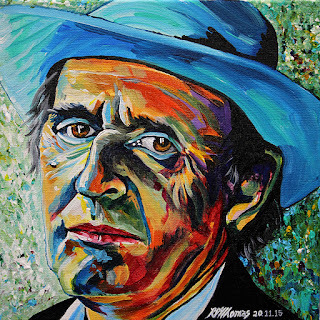 The process of rediscovering the music of Ron Hynes - I once played a number of his hits early in my radio career - and talking to people who were connected to him has brought him into a small cadre of artists that I can (and do) listen to over and over again; among them are names like Bob Dylan, Ron Sexsmith and Mark Knopfler. I listen to deeply beautiful songs like "Sorry Lori", "Tiger Lily" and "Atlantic Blue" and hear the complexity of the man and his relationships, the depths of his feeling, and the sense that one day it was all going to end. There is so much wrapped up in the words and how he sings them. It's better to be famous for the wrong I done tonight than to be nobody all my life, he sings in "Judgment". What a great line, not only in the context of the song, but hauntingly, how he lived his life. The Man of a Thousand Songs was revered in Newfoundland and throughout Canada. "The greatest songwriter I ever met," shared Alan Doyle. "Ron Hynes was our poet," wrote Tom Power. "He wrote songs that told the story of who Newfoundlanders were, are, and becoming." I have found solace and solutions in the lyrics and vocals of Bob Dylan for the better part of 30 years. Having fallen in love with Ron's music, I fully suspect that 30 years from now I'll be in front of a canvas, brush in hand, listening to (and feeling) "Atlantic Blue". Thank you Ron for the gifts you left us all.